A size 14 Mickey Finn got the job done today. The other day, I watched a friend of mine hook and lose a salmon. I'm not sure what he hooked the fish one, but I think it was a relatively large fly. Some very unscientific polling indicated that others had recently lost salmon on medium-to-large flies. On the other hand, I (and my clients) have been having great success hooking and landing salmon on small Mickey Finns lately. Some of these Mickey Finns are quite small, down a sz. 14, 4X long trout streamer hook. Good technique and strategy probably has something to do with the high percentage of landed fish, but not it's not the whole picture (more on technique at a later date...). 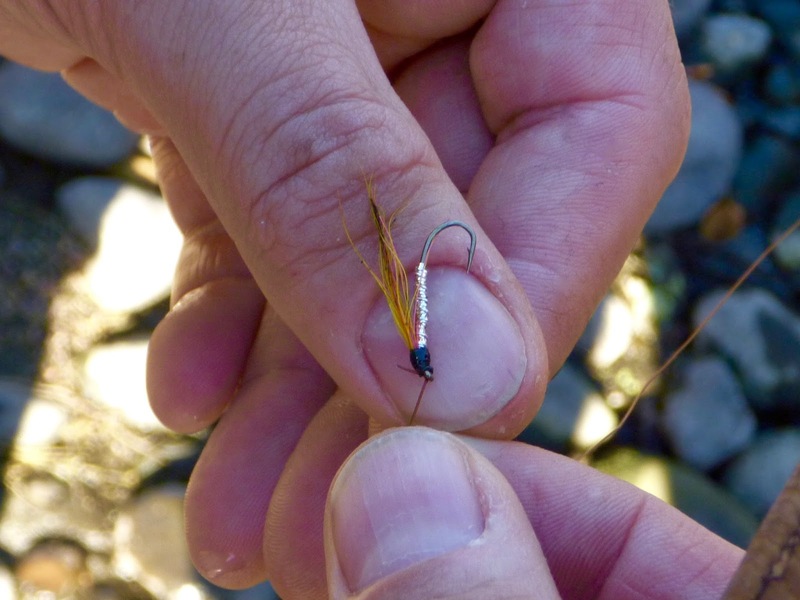 Low water often dictates the use of smaller flies. Ok, we get it. But the salmon seem to be going after large stuff, too. So why are they coming unhooked so easily on large flies but are staying hooked up on the small stuff? I don't the fly size is the culprit so much as the thickness of a hook's wire. The water is extremely low at the moment. It's historically low on the Naugatuck. When a fly is swung (or stripped), then taken by a salmon, the current is almost no help when it comes to driving a hook into the fish's jaw. My theory is that heavy wire (or even medium wire) hooks just aren't penetrating the fish's jaw with enough force to stay embedded. Enter the small Mickey Finns, tied on very light wire hooks...If I tried to push a knitting needle through the palm of my hand, I'd have to push with some force. On the other hand, if I pushed a small sewing needle through my palm, it would require very little force. I think our positive hooksets have been a result of using fine wire hooks. Very little force is needed to drive these hooks home, which is perfect given the current conditions. Not to mention the flies are small enough not to set off any "red flags." Salmon have been consistently taking Mickey Finns in sizes 10-14. The only drawback is that the hooks bend easily. However, the fish have not been big enough for that to be much of a concern (yet). My advice...ditch the medium-to-heavy wire hooks until the water comes up. 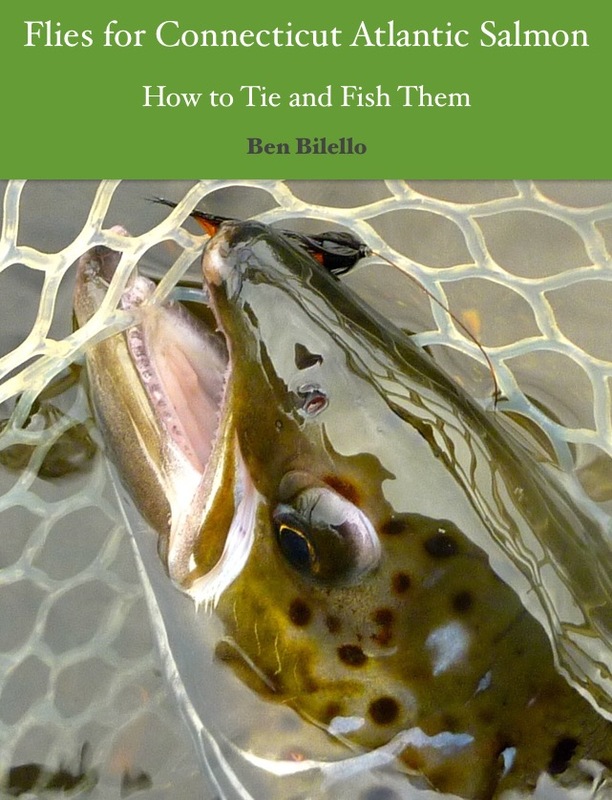 Use finer wire hooks, such as trout hooks and/or low water salmon irons. Update: After writing this, I found an interesting article that helps support my theory. Great article, and that is so true. I was once fishing sea run rainbows in PEI with a friend of mine, he was using the new mustad signature salmon and myself the daiichi 2161. His hookup and land ratio was 4/5 and mine was 1/4... Just goes to show, sometimes the most expensive or "pretty" hook isn't always the most effective.